Call 908.598.5514 or use the form below to contact us. Annually, more than 600 volunteers help SAGE fulfill its mission. 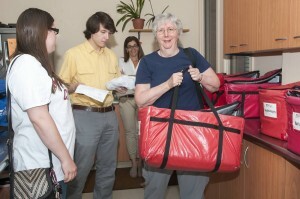 Some volunteers deliver food as part of our Meals on Wheels program, others have learned how to recane chairs and repair furniture, others shop and run errands for older members of the community who cannot do so on their own, and some serve as receptionists in our lobby. They all have one thing in common. They have all discovered how incredibly rewarding it is to help SAGE . . . to make a difference in the lives of older members of our community who need support. Whatever it is you want to do, you can be sure we want and need your help! Do you have a special skill you would like to share? Call us! If you are interested in volunteering at SAGE Eldercare, please call the Director of Volunteers at 908.598.5514. You’ll be glad you did . . . and so will SAGE!